What started as an internal student event brought the whole Catholic Community together! 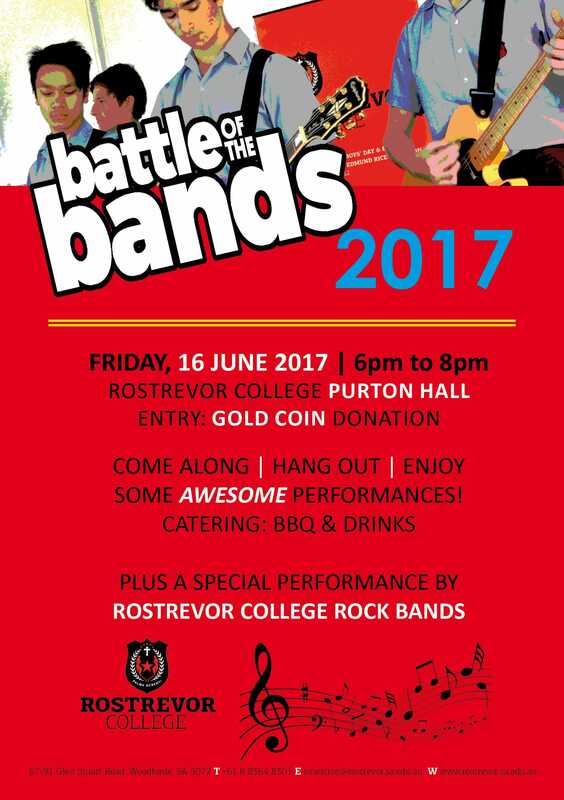 Due to popular demand, Rostrevor College is pleased to announce that it will again host Battle of the Bands, a 2016 Prefects initiative, open to all Catholic schools in South Australia. In 2016 eight Catholic schools participated including; St Aloysius Primary Choir and Stage Band, CBC Senior Choir, St Mary's Senior Rock Band, St Paul's College Junior Rock Band, Rostrevor College Senior and Junior Rock Bands, St Francis Xavier Rock Band and Senior Ensemble, Loreto College Year 10 Rock Band and St Francis of Assisi Choir. The event attracted 300 performers with over 800 spectators. While the event is titled "Battle of the Bands", it is not designed to be competitive. The aim is to provide Catholic Schools in South Australia an opportunity to come together and celebrate the performing arts through music and dance. Schools are invited to perform via their stage bands, choirs and dance groups and from both Primary and Secondary Schools. Each act will be allocated a timeslot of 5-7 minutes. The evening will commence at 6pm and should conclude around 8pm in the Purton Hall. This is a charity event and any money raised will contribute to the 2017 Prefect Charity, Edmund Rice Camps. Edmund Rice Camps provide holiday experiences for young people aged 7 - 16 years who would not otherwise be able to enjoy them. Many of the participants come from what could be considered as marginalised or disadvantaged backgrounds and wouldn't be in a position to afford such an experience; the money raised will contribute to making this experience a reality for a number of these young people. We encourage as many families as possible to come along and enjoy the occasion. With the support of your school community, the event will certainly be a night to remember as was the case in 2016. Rostrevor College is also being supported by the Parents' & Friends' Association, who will assist with catering on the night. Catering will be on offer from 4:45pm for those arriving early.